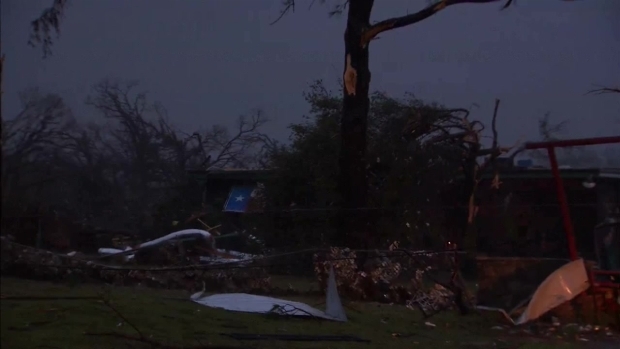 A severe thunderstorm, that spawned a tornado, damaged at least a dozen homes scattered over a rural area of North Texas Monday evening. The storm roared through the area near Cool and U.S. Highway 180 – between Weatherford and Mineral Wells – at about 6:15 p.m.
Tuesday afternoon the National Weather Service confirmed the damage was consistent with an EF-1 tornado. "It's about a half-mile wide, not very long. Apparently it hit and went back up maybe a half-mile deep," said George Teague, with Parker County Emergency Management. In addition to the homes, some vehicles were damaged by flying debris. "The car shook at little bit, and that was about it. Couldn't see anything but wind and rain," said witness Joel Kertok. One minor injury has been reported. NBC 5's Scott Gordon was in the Texas Thunder Truck as the strong storms hit the city of Cool in Parker County. Each of the people affected will be staying with friends or family until the cleanup can be completed. But with several more days of rain in the forecast, that may take some time. And the emergency management coordinator said he knew he was in for a long night when he saw the damage live on NBC 5. "I flicked the TV over to Channel 5 and see what was going on, and there was a live shot from the Thunder Truck showing the damage. So then I knew, time to put your shoes on and get to work," Teague said. Heavy rain created dangerous driving conditions in many parts of North Texas Monday, including Denton where one driver became stranded in high water. Elsewhere, heavy rain caused areas of flash flooding in North Texas. At least one car was stranded by high water on the Interstate 35 service road at Underwood Street in Denton. Forecasters caution that several more inches of rain are expected to fall across North Texas by Friday.